Today, August 15, marks the anniversary of Constantinople's victory over Muslim invaders in what historians commonly call the "Second Siege of Byzantium," 71718. Prior to this massive onslaught, the Muslims had been hacking away at the domains of the Byzantine empire for nearly a century. The Muslims' ultimate goal was the conquest of Constantinople — for both political and religious reasons. Politically, Islam had no rival but the "hated Christians" of Byzantium, known by various appellations — including al-Rum (the Romans), al-Nassara (the Nazarenes), and, most notoriously, al-Kilab (the "dogs"). The eastern Sasanian Empire had already been vanquished, and Persia subsumed into the caliphate. Only the "worshippers of the cross" — as they were, and still are, disparagingly known — were left as contenders over the eastern Mediterranean basin. More important, Constantinople — from a theological perspective — simply had to fall. From the start, Islam and jihad were inextricably linked. The jihad, or "holy war," which took over Arabia and Persia, followed by Syria, Egypt, and all of North Africa — all formerly Byzantine territory — was considered a religious obligation, or, as later codified in sharia law, a fard kifaya: a communal obligation on the body of believers, to be adhered to and fulfilled no less than the Five Pillars of Islam. As the famous 14th-century Muslim historian Ibn Khaldun put it: "In the Muslim community, the jihad is a religious duty, because of the universalism of the Muslim mission and the obligation to convert everybody to Islam either by persuasion or by force. . . . Islam is under obligation to gain power over other nations." This concept of jihad as institutionalized holy war was first articulated and codified into Islam's worldview by "warrior-theologians" (mujahidin-fuqaha) living and fighting along the Byzantine-Arab frontier (such as the mujahid Abdallah bin Mubarak, author of the seminal work Kitab al-Jihad or "Book of Jihad"). The prevalent view was that, so long as Constantinople stood, the Cross would defy the Crescent. This is a literal point: Symbols played a great role in these wars. Less than a century earlier, at the pivotal battle of Yarmuk (636), where the Muslims crushed the Byzantines, leading to the conquest of Syria, one Muslim complained to the caliph, saying, "The dog of the Romans [Emperor Heraclius] has greatly frustrated us with the ubiquitous presence of the cross!" Indeed, one cannot overemphasize the religious nature of these wars — which, if still codified in Islam's sharia, has become all but alien to a Western epistemology that tends cynically to dismiss the role of faith. That the primary way of identifying oneself in the old world was based on religious affiliation — not race, ethnicity, or nationality, all modern concepts — is indicative of the central role of faith. Even useful terms such as "Byzantines" are ultimately anachronistic; "Byzantines" identified themselves first and foremost as "Christians." For these reasons, the conquest of Constantinople would take on increasingly apocalyptic proportions in Islamic literature. Ever since the Muslim prophet Mohammed sent a message in 628 to the Byzantine emperor Heraclius, summoning him to Islam, with the famous assertion, aslam taslam — that is, "submit [become Muslim], and you will have peace" — and the summons was refused, Constantinople became Islam's arch-enemy. Mohammed even prophesied that the Christian capital would — indeed, must — fall to Islam, with blessings and rewards to the Muslim(s) fulfilling this prophecy. Fall the great city would — but not for some 800 years, in 1453, giving an inchoate Europe the needed time to mature, strengthen, and unify. Beginning with Mohammed's participation at the Battle of Tabuk (630), recorded in the Koran, Muslims had been harrying the Byzantines for decades, closing in on Constantinople. With the coming of the Umayyad dynasty (660) — which also saw the end of the first fitna (Muslim "civil war"), resulting in the Sunni-Shia split — Islam's seat of power moved from Medina to recently conquered Damascus, mere miles from the prize of Constantinople. By the early 700s, the Muslim conquests were slowing down. There were several "disaffected" parties in the Muslim camp — particularly the losers of the first fitna, the Kharijites and Shia, the former a particularly ruthless sect. To prevent another civil war from erupting, a major campaign against the common infidel enemy was in order. A single anecdote supports the chroniclers' claims that a gargantuan army was being mustered. Two years prior to the siege, in 715, a report reached the Christians that the Muslims were felling countless trees in Lebanon, land of the cedar, in order to construct tens of thousands of warships for an "upcoming expedition." This fact alone caused a mini-war to erupt on the island of Rhodes, where the Byzantines sent an army to intercept the Muslim expeditionary force. One Byzantine ambassador returning from Damascus reported that the "Saracens were preparing an armament by sea and land, such as would transcend the experience of the past, or the belief of the present." In short, 120,000 infantry and cavalry, and a naval force composed of 80,000, were making their way to Constantinople. Maslama, leading the land force through Anatolia, crushed and put to the sword all in his way. Women and children were enslaved; tens of thousands of men crucified. While making their way through that great desolate no-man's land between the Byzantine and Umayyad empires, frequented by nomadic tribes, the Muslims attacked, slew, and burned all in their path. Enter Leo III — also known as Leo the Isaurian, Leo the Arab, and, most notoriously, Leo the Heretic. There is little doubt that the Byzantine victory over the Muslims owes a great debt to Leo, who makes his appearance early in the pages of the chronicles as a general and strategist — living up to the Greek word for "general," strategos. Born as Conon in modern-day Syria (hence the "Arab" appellation), Leo, stationed in Anatolia, encountered the forces of Maslama early on. All the sources record Leo playing something of a cat-and-mouse game with the caliph's brother, duping him in various ways. Tabari simply concludes that Leo dealt Maslama "such a deception as if he [Maslama] was a silly plaything of a woman." At any rate, Leo gained the necessary time and advantage to slip back to Constantinople, where, as the ablest man to defend the empire from the coming onslaught, he was soon proclaimed emperor. Considering the empire's strong walls that had withstood countless sieges for centuries, Leo knew that, as long as sea communications were open, the city would be relatively safe. The problem was that, as Maslama was nearing with his land force of 120,000, 1,800 vessels containing the additional 80,000 fighting men were approaching the Bosporus. The city would be surrounded. A close reading of the sources reveals that two important factors saved the empire: Arab inexperience at sea warfare and Greek ingenuity. The Arab warships nearing the Bosporus were heavy-laden with equipment and, in general, cumbersome. To lure the ships, Leo, in another stratagem, had the ponderous chain that normally guarded the harbor cast aside. "But while they hesitated whether they should seize the opportunity . . . the ministers of destruction were at hand": Leo had sent out his fleet, with the secret weapon of the day, "Greek fire" (an incendiary composition projected by means of siphons), which conflagrated the Muslim ships into "blazing wrecks": "Some of them, still burning, smashed into the sea wall, while others sank in the deep, men and all." Soon after this pivotal defeat, the ambitious caliph Suleiman, who had meant to fulfill Mohammed's prophecy by conquering Constantinople, died of "indigestion" (according to the chroniclers, by devouring two baskets of eggs and figs, followed by marrow and sugar for dessert). To make matters worse, the new caliph, Omar II, seemed, at least initially, not to be as attentive to the needs of Maslama's army. Winter set in, and the Byzantines retired to their fortified city, leaving the elements to deal with the Muslim camp. "One of the cruelest winters that anyone could remember" arrived, and, "for one hundred days, snow covered the earth." Still, Maslama's brother, the late caliph, had commanded him to "stay there [Constantinople] until you conquer it or I recall you." Neither had happened; the latter option was no longer possible. All Maslama could do was wait and assure his emaciated, desperate men: "Soon! Soon supplies will be here!" In the meantime, roaming Turkic tribes, particularly the Bulgars, who had yet to embrace Islam, began harrying the Muslim camp. By springtime, reinforcements finally came, by both land and sea. It was not enough; frost and famine had hit the massive army of Maslama hard, to the point that cannibalism was resorted to. The Greek chronicler Theophanes relates: "Some even say they put dead men and their own dung in pans, kneaded this, and ate it. A plague-like disease descended on them, and destroyed a countless throng." The plausibility of the second sentence offers support for the improbable first one. An independent chronicler, Michael the Syrian, wrote: "The hunger oppressed them so much that they were eating the corpses of the dead, each other's feces, and other filth." From the new caliph's point of view, that such a massive force, years to mobilize, was already at the gates of Christendom, made it very difficult to simply give up. As caliph — successor to the warrior-prophet and his companions, who had subjugated much of the known world — he could not accept defeat so easily. While the army made do, a new navy, composed of two war expeditions, one from Alexandria, Egypt, the other from North Africa — nearly 800 ships total — made its way to Constantinople. Under cover of night, they managed to blockade the Bosporus, threatening to cut off all communications from the city. Moreover, the Muslim commanders were warier of the Greek fire, and kept their distance. Aware of this, Maslama's army, somewhat recovered owing to supplies and fresh conscriptions, was once again on the move, besieging the city with — considering the abominable trials to which they had recently been subjected — a feral fury. It seemed that the beginning of the end, though delayed, had finally arrived. Delivery for Constantinople came from the least expected source: the Egyptian crew manning the Alexandrian ships, the Christian Copts. Because the vast majority of the caliphate's fighting men, the mujahidin, were already engaging the enemy, the caliph had no choice but to rely on Christian dhimmi (second-class) conscripts for reinforcements. Much to the caliph's chagrin, however, the Copts all fled at nighttime to Constantinople, and acclaimed the Christian emperor. Theophanes writes that, as the Copts seized light boats and fled in desertion to the city, "the sea looked entirely made of wood." Not only did the Muslim war galleys lose a good deal of manpower, but the Egyptians provided Leo with exact information concerning the Muslims' ships and plans. Taking advantage of this, Leo once again released the fire-ships from the citadel. Considering the loss of manpower after the Copts' desertion, the confrontation was more a rout than a battle. It is worth noting that this little-known fact — that Copts abandoned the Muslim fleets in droves to join forces with the Christian emperor — indicates that, from the start, Christian life under Muslim rule was not as tolerable as later revisionist history (which claims that the Copts of Egypt welcomed the Muslims as "liberators" from the Byzantine yoke) makes it out to be. Seeking to capitalize on this naval victory and the enthusiasm of the Christians, Leo had the retreating Muslim fleets pursued on land, and many Muslims were cut down. 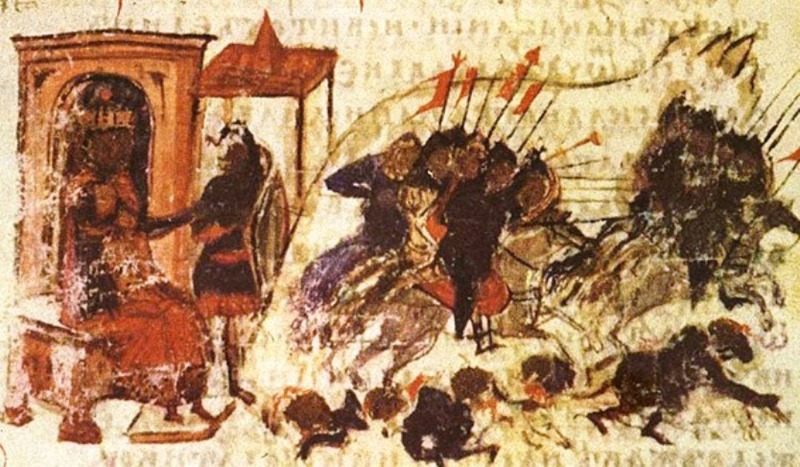 Simultaneously, the neighboring Bulgars — who, though occasionally hostile to the Christian empire, had no love for the new invaders, the Muslims — were persuaded by Leo's "gifts and promises" into attacking and ultimately killing as many as 22,000 of Maslama's battle-weary, half-starved men. Still, the Muslims' troubles were far from over. Nature was not through with them. A terrible sea-storm is said to have all but annihilated the retreating ships, so that, of the 2,560 ships embarking back to Damascus and Alexandria, only ten remained — and of these, half were captured by the Byzantines, leaving only five to make it back to the caliphate and report the calamities that had befallen them (which may be both why the Arab chroniclers are curiously silent about the particulars of these events, and why it would be centuries before Constantinople would be similarly attacked again). This sea-storm also led to the popular belief that divine providence had intervened on behalf of Christendom, with historians referring to August 15 as an "ecumenical date." Meanwhile, in the Islamic world, this defeat, earthquakes in Palestine, and the death of Caliph Omar II in 720 (having been caliph in the year 100 of the Islamic calendar) boded an apocalyptic end to the world. It is difficult to exaggerate the significance of this battle. That Constantinople was able to repulse the caliphate's hordes is one of Western history's most decisive moments: Had it fallen, "Dark Age" Europe — chaotic and leaderless — would have been exposed to the Muslim invaders. And, if history is any indicator, the last time a large expanse of territory was left open before the sword of Islam, thousands of miles were conquered and consolidated in mere decades, resulting in what is known today as Dar al-Islam, or the "Islamic world." Indeed, this victory is far more significant than its more famous Western counterpart, the Frankish victory over the Muslims at the Battle of Tours, led by Charles Martel (the "Hammer") in 732. Unlike the latter, which, from a Muslim point of view, was first and foremost a campaign dedicated to rapine and plunder, not conquest — evinced by the fact that, after the initial battle, the Muslims fled — the siege of Constantinople was devoted to a longtime goal, had the full backing of the caliphate, and consisted of far greater manpower. Had the Muslims won, and since Constantinople was the bulwark of Europe's eastern flank, there would have been nothing to prevent them from turning the whole of Europe into the northwestern appendage of Dar al-Islam. Nor should the architect of this great victory be forgotten. The Byzantine historian Vasiliev concludes that "by his successful resistance Leo saved not only the Byzantine Empire and the Eastern Christian world, but also all of Western civilization." Yet, true to the vicissitudes and ironies of Byzantine history — the word has not come to mean "convoluted" for nothing — by the time Leo died, "in the Orthodox histories he was represented as little better than a Saracen" (hence the famous appellation, "Leo the Heretic") owing to the Iconoclastic controversy. If Charles Martel would be memorialized as the heroic grandfather of the first Holy Roman Emperor, Charlemagne, it would be Leo's lot to be all but anathematized — an unfortunate fact contributing to the historical neglect of this brilliant victory. Just a few of the comments that added useful information. "......to the shores of Tripoli" sounds the first stanza of the Marine Corps Hymn. When they defeated the Muslim Barbary Pirates of the coasts of North Africa, an Arabian sword was presented to the Marine officers and remains the pattern for the Corps' ceremonial sword today. These are the same Muslims that Obama claimed contributed so much to America's foundation. "Politically, Islam had no rival but the "hated Christians" of Byzantium, known by various appellations — including al-Rum (the Romans), al-Nassara (the Nazarenes), and, most notoriously, al-Kilab (the "dogs"). The eastern Sasanian Empire had already been vanquished, and Persia subsumed into the caliphate. Only the "worshippers of the cross" — as they were, and still are, disparagingly known — were left as contenders over the eastern Mediterranean basin." You seem to have forgotten the Byzantine's allies the Khazar Empire. The Siege of Byzantium occurred during the Second Arab-Khazar War, and was broken because the Khazars retook Derbent and invaded Arran and Kavkaz Albania (present Azerbaijan). The Caliphate had many enemies. It could only move on the Khazars and Byzantines because they had crushed the GokTurks in 712. The Battle of Tours was important for the West, but had little significant to the Caliphate. actually race and the physical characteristics of different peoples, nations, tribes and clans were not unknown or ignored. They were very well understood by the ancients. Not sure where the author gets this fanciful notion from. If you can't beat an enemy in a stand up battle, you infiltrate and defeat him from the inside. One thing that Western Civilization has yet to realize, is the fact that we have yet to pick a jihadist Muslim nation and eliminate them as an example of what it to come, if they do not cease their war on the West. Westerners do not war on Muslims, therefore, similar to how the Allies ended World War Two in the Pacific, if one bomb is not enough, then two or more will be laid until the enemy surrenders. What the West continues to curry favor with these barbarians, is beyond my comprehension. The West needs to adopt the Ancient Romans' mentality of waging total war, not worrying about rules of engagement or casualities. Get in and get out. The Muslims are on a world jihad with their bent of establishing a Calipate that is not compatible with our visions of Democracy, therefore, it is either us or them.